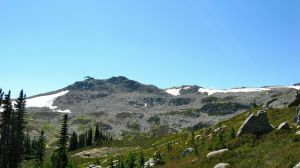 A hill located on the broad divide between Fitzsimmons Creek and the Cheakamus River south of Whistler, BC. It's the highest of the "Musical Bumps" and is aligned to take full advantage of the prevailing southwesterlies in this area. This small peak provides a sudden uplift for storm systems and a lee slope to the northeast collects the benefits. As the northeast face is moderately steep and wind loaded, it is popular with skiers and also tends to slide regularly. On the rare occasions when strong northerly outflows strike the region, Piccolo Summit works exactly in reverse, collecting shifted snow on the southwest aspect. More than a few skiers have subsequently taken a surprise ride down the southwest face after these episodes. Access is via the charlifts of Whistler Mountain. From the top of Harmony Bowl, hike south to reach the summit.